Indeed, blades have come a long way in the past few years when it comes to supporting virtualization initiatives. Vendors have addressed early challenges with I/O throughput, provisioning and management, to the point where blades deliver both a lower initial cost and clear advances in total cost of ownership (TCO), scalability and manageability for many workloads and application environments. This is particularly true of blades from the blade server and virtualized server market leader, Hewlett-Packard. HP blades utilize advanced management platforms such as HP Insight Software and HP Integrated Lifecycle Automation to deliver signifi-cant efficiencies in managing, monitoring and provisioning blade servers for virtualized environments. 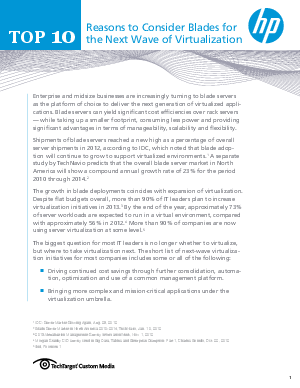 Download this whitepaper to learn the top 10 reasons your organization should consider blade servers.